Cooler Master has launched a hardware giveaway in order to promote the launch of its new Silent Pro Gold Series Power Supplies offering some cool prizes. 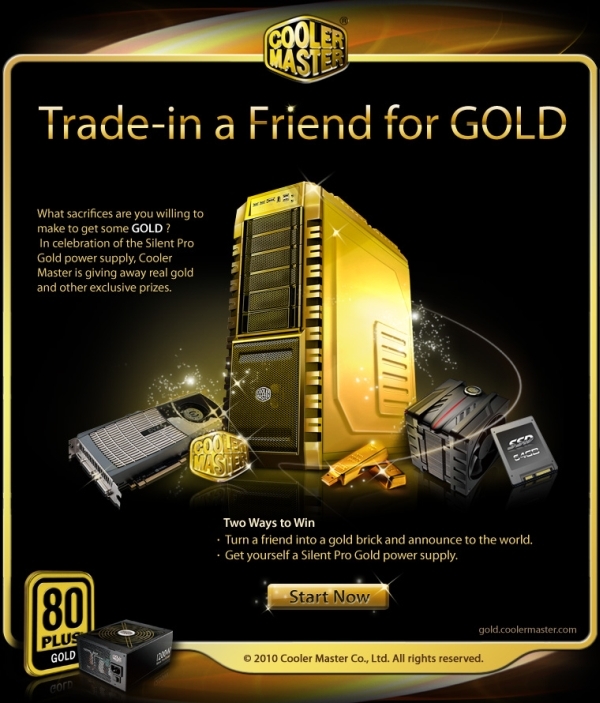 The giveaway includes a flash game lucky draw every week winning you some gold trinkets along with cooler master products like the Haf X Gold case, V6 CPU cooler, a 64GB SSD and a Gold USB drive while the owners of the Silent Pro Gold Series can use their serial number to enter in the GTX480 lucky draw along with every other goodies. For information about the Lucky draw and to enter it, Click here. Travis Strikes Again: No More Heroes Giveaway – Enter for a Chance to Win One of Three Full Game Codes! PlanetSide Arena Sanctuary Assault Edition Giveaway – Grab a Code to Get Into the Beta!